Whichever way we look at it, our governments radically change under the influence of technology. As a result, our lives in interaction with public sector bodies are easier and more agreeable. Services improve, communications run more smoothly. 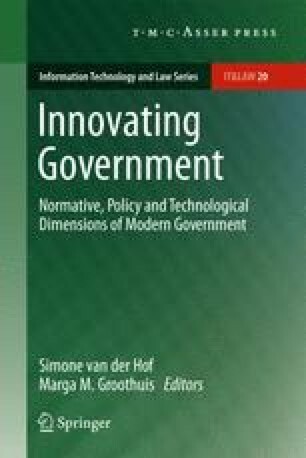 However, without a doubt the creation of an electronic government (e-government) also makes us more vulnerable and more dependent: dependent not only on technology itself, but also on the organizations within government that either apply technology, collect, and use citizen-related information or demand of citizens to submit themselves—voluntarily or not—to technological applications and their effects. And, government itself changes face at well. Throughout the centuries technology has proved capable of having an enormous influence on the way our society works and functions. Innovations in printing, shipping, and industrialization have shaped and framed our concept of politics and government–citizen relationship. In ways we only begin to understand today, but did not always do at the time. That is precisely why the social implications of the use of technology by government demand that choices are made. Choices made not only by individual public sector bodies, but also most certainly by people in politics, government, and legislation. In the search for the guiding principles that are to be used as preconditions for these choices, we need to get an in-depth understanding of the developments related to electronic government. This book aims to contribute to this understanding.